It was long past time to upgrade Littleflogger to his next level backpack. He's six years old and it's time he carried his own weight. OK, maybe not the full 50 pounds, but at least his lunch and a few layers. We've got a full travel schedule this year and the pack will function as carry-on and destination daypack, so we set out to find the right pack and we happily ended up with the REI Tarn 18. The Tarn comes in 12, 18, 40 and 65 liters, with the 12L for 5-8 years and the 18L for 8-12 years. We went with the 18 for our 6yo, wanting the extra space for puffy layers in the Alaskan winter and for snacks, toys and books for car and air travel. It still fits him just barely and gives him some room to grow and some extra organization options, but the 12L probably would have worked fine too. The 18 has pockets on the hip belt and load lifter straps to cinch the main compartment tight, and other than that and the size is pretty much identical to the 12. Both have dual stretchy mesh bottle pockets, a large stuff pocket on the front (remember the front is the back - opposite the shoulder straps - when you're talking packs), and a top front zipper pocket for smaller more frequent access. Inside is a hydration bladder sleeve, a clip on a lanyard and a small zipped pocket on the flap with a cool graphic that shows the ten essentials. On the front of the stuff pocket are daisy chains, and on the bottom there are even four lashing points. I don't see us ever using any of those but hey, you never know. The sternum strap has a whistle, sure to be a hit with any normal loud-noise-loving kid, and a safety feature to boot. Overall this is a great and reasonably price pair of kid's packs, and either one will pull duty from school to the Jungfrau. For a video comparing the two see the link below. Inline skates are great, and its no mystery that we're big fans of Rollerblade. Even if inline skating is not as hugely popular as it used to be (like a lot of sports), it's still fun in its own right and proven effective training for ice skating, skate skiing and other sports and activities based on similar movement patterns. But what about the little floggers? It's a pain to buy them new footwear every year as they consistently convert hot dogs and mac and cheese into larger feet. Rollerblade to the rescue, with the adjustable Spitfire XT kids inline skates. The Spitfire comes in three macro sizes, each of which adjusts to a range of toddler shoe sizes: 2 to 5 (this size only has 3 wheels), 5 to 8 and 11 to 1. That's FOUR full sizes. Every parent who has ever bought kids shoes will know immediately what a big deal this is. The skates are built to the usual Rollerblade quality level, which is very high. Padding is comfortable, and the fit is secure with a combination of laces, buckles and velcro. The right skate has a very beefy brake, which is good because the combination of 72mm wheels and SG3 bearings make the skate as fast as your kid wants it to be. Our five year old was fascinated by the whole process, and since we're putting him on ice skates in the winter (Winter is coming!) we're thrilled as well at the prospect of year-round skate practice. Older kids will have no problem putting the Spitfire on, while younger ones will need a hand with the closures. Once up and running - with helmet and pads, for the love of Spock! 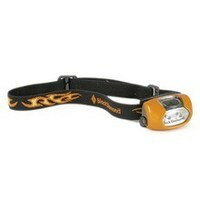 - your kid can progress from garage to street to trail, and the Spitfire XT will keep up with their growth for years. All in all, the price of entry here for a fun and useful sport is exceedingly reasonable. Kids. Long trips in planes, trains and automobiles. You better be good at killing time time or you might want to kill yourself to get out of the misery. Good parents try to minimize screen time, but every parent knows there comes a point at which it's not reasonable to expect kids to entertain themselves on hour eight in the same seat on an international flight. And when that time comes, that fancy screen will be a lot more entertaining with audio. Problem: kids don't like headphones. Solution: fun-looking headphones built for kids. Kidz Gear has it wired, literally, with their corded headphones for kids. They come in bright colors, are sized appropriately, adjust easily and best of all are volume limited to protect their precious little ears. They even include a good quality storage bag with drawstrings. Our 2.5 year old didn't like them at first, but with a little gentle coaching he eventually realized he could hear Disney-Pixar's Cars a lot better with headphones on. From then on they were HIS headphones and now all is good. Seriously, given the problem this solved for us the price looks like perhaps the greatest bargain in the history of time. There are a few critical items necessary to an enjoyable outing with the LittleFlogger. Key among these is a good sleep system, with the criteria for good being: synthetic fill (for spilled liquid, either from internal or external sources), roomy and warm. The Big Agnes Little Red +15F hits them all out of the park. The Little Red is a rectangular polyester-fill bag with a DWR nylon shell that will house up to a 4ft 5in LittleMonster. The clever 2lb 9oz design incorporates mummy-bag features to maintain warmth: a cinchable hood, draft yoke around the neck and a beefy full-length draft tube backing the zipper. Two more features make this an ideal bag for kids: an internal pillow sleeve fixes the head support in place, and an external pad sleeve accomodates any 20"x48" pad, such as the Big Agnes 3/4 length Air Core. No rolling off the pad, and really this feature alone makes this an awesome bag. There are holes in the head corners that allow the pad to be inflated/deflated without removing it. The extra room allows for the normal kid night-long biathlon of tossing and turning, and there are internal loops for sleeping bag liners. The best thing to do is to set it up before you go camping and let your kid become familiar with it at home. The LittleFlogger will be jumping in and out of it in no time; don't force it, it'll happen. Once they've made friends you can hit the road, and you'll both be in dreamland instead of fighting with your gear. Highly recommended. I guess with a product lineup as vast as Black Diamond's, they're bound to pinch a stinker once in a while. They have done so with their Wiz headlamp, designed - so they say - to be kid-friendly somehow. Claims: it's smaller, less bright, more durable and has a "tiltable housing." There are plenty of other lamps, including many by BD, that match these specs, so I'm calling bulls**t. The only truly useful feature is that it supposedly shuts off after one hour to save battery life; I haven't bothered to leave it on that long, but if true I'll give them a point. Then I'll take away ten for the crappy on/off switch that requires you to press hard and hold it down for longer than the average kid has patience for. Once it's on, pressing briefly on the switch in a normal way turns it to strobe and back. You have to hold it down to make it go out, which is surprisingly difficult for the kids I watched try to figure it out. Back to the drawing board, BD. I recommend finding an ACTUAL CHILD to test it this time. And no, prolonged adolescence in your "extreme athletes" doesn't qualify them for the job. 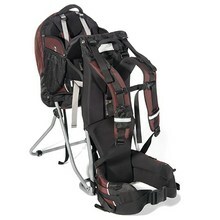 Don't be fooled by the looks of the REI Piggyback child carrier. What appears at first glance to be some kind of medieval torture device is in reality a very comfortable backpack that allows your offspring to achieve their full potential as a crosstraining partner. As the LittleFlogger nears 40 pounds he becomes an ever-more-realistic training aid for carrying big mountain loads. The Piggyback makes it happen with adjustable everything for you and your passenger. Parents can switch torso sizes relatively easily. It's hydration compatible and includes lots of nice little touches like a tethered mirror, removable daypack and a good kickstand. The high seat means a good view for kids. If you're under 5'2" or over 6'2" you should make sure it fits you, but you probably already know that. A separately available diaper back expands capacity. Quibbles: it's really big, there's a useful mesh pouch on one side but not the other, and no belt pouches for cameras, phones, etc. All in all a great value.